Look at those adorable kids. And they're all mine!!! 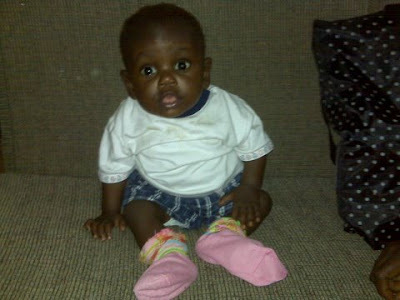 Cami's wonderful husband Ryan sent the picture of Haven yesterday when he got to Kinshasa. He is in the first group of families that traveled this week and Brian will be part of the second group, leaving on Wednesday. Cami called me from to let me know that the picture had been sent to my email. I could barely open the website I was starting to get so teary-eyed. Haven looks so good, so chubby and alert! Check out Cami's blog for all the latest updates from the trip so far. She and Ryan are adopting two beautiful children to go with the two cuties they already have at home. You may remember me mentioning Cami in an earlier post. She is the one who did all the amazing work to reunite a refugee family with their orphaned grandchildren. Cami is a real live HERO!! !You can see their pictures on her blog. Grace is going through an adorable hat phase. And the only color that she regularly identifies is PINK. Go figure! The picture below is for my dear friend Alicia. She is finding it hard to keep up with her Mugshot Monday's since becoming a mommy, so I am posting a pic of her two favorite boys on her behalf.